Ernest E. "Skinny" Fegley, 92, of Keefer Rd., Pine Grove, passed away on Thursday, August 30, 2018 in the Hershey Medical Center. Born on November 2, 1925 in Pine Grove, he was a son of the late Horace E. and Annie R. Herring Fegley. He was an Army veteran having served during WWII and fought at the Battle of the Bulge and in Rhineland. He was a member of Co A 263rd Engr Combat Battalion. 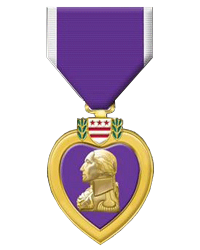 He received the Purple Heart, European African Middle Eastern Theatre Campaign Medal and the Good Conduct Medal. Ernest worked as a Mechanic. Preceding him in death were his wife Grace A. Bachert Fegley; a daughter Anne Stutzman; one grandson; three brothers, Joe, Horace and Harold Fegley; three sisters, Grace Emerich, Helen Zimmerman, and Mildred Weston. Surviving are his children, Marie and husband Dennis Aungst of Pine Grove, Tina and husband Ronald Mattern of Gratz, Ernest and wife Karen Bachert of Schuylkill Haven, Beth Wolfe of Pine Grove, Ruth and husband Brian Todero of Pine Grove, Bonnie and husband Ronald Aungst of Pine Grove, Joseph and wife Karen Fegley of Pine Grove, John and wife Lori Fegley of Pine Grove, Donna and husband Michael Hillenbrand of Harrisburg; a step daughter Judith and husband Thomas Fickinger of Pine Grove; 21 grandchildren, 22 great grandchildren; two brothers, Paul Fegley, and Gene Fegley, a sister, Frieda Beasley; nieces and nephews. Funeral Services will be held on Tuesday, September 4, 2018 at 10:00 A.M. at the H. L. Snyder Funeral Home, Inc., Pine Grove with Pastor Nelson Reppert officiating. There will be a viewing on Tuesday, September 4, 2018, from 9:00 A.M. until 10:00 A.M. at the Funeral Home. Interment will follow in Hetzel's Cemetery, Pine Grove. In lieu of flowers, the family would prefer contributions be made to the Ruth Steinert Memorial SPCA, P.O. Box 332 Schuylkill Haven, Pa. 17972 in his memory.